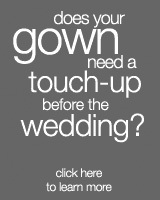 Davis Imperial Cleaners’ full-service alterations department is staffed with experienced professional seamstresses prepared to expertly complete everything from a simple hemline to the most elaborate and extraordinary bustles, as well as the resizing and/or restyling of a wedding gown. Offering a complimentary consultation, our wedding gown coordinator, in collaboration with a seamstress, will precisely detail what services will be necessary to truly make your gown your own. From the initial consultation and all fittings thereafter, we recommend that you bring the undergarments and exact shoes you intend to wear with the your gown to ensure consistency in fit. Our alterations staff is grateful and honored when entrusted with the important task of fitting your gown for your special day, and it is reflected in their meticulous approach to their work. We recommend the initial consultation to be three to six months before your wedding and three fittings scheduled approximately four to six weeks apart, with a target final fitting date of approximately four weeks before your big day. Hand pressing, tissue shaping, and delivery service to the event location or the site where you will be dressing can be scheduled at the time of the final fitting. Clients requiring bridal and/or eveningwear alterations are seen by appointment in order to provide the ultimate in personalized service.